Dave Buchanan says Friday’s 4-1 friendly win over Birmingham City Under-23s brought the curtain down on ‘a fantastic week’ in Spain for the Cobblers. After five days of intensive training at the Oliva Nova complex on the east coast of Spain, with the players being put through their paces with double sessions, Justin Edinburgh’s side proved too strong for the Blues youngsters. 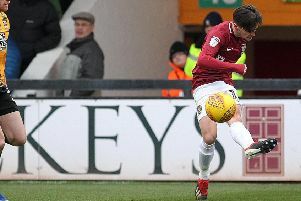 Alex Revell fired the Cobblers ahead after just seven minutes, and although City equalised on 22 minutes to ensure the teams were all square at the break, second-half strikes from Billy Waters, Marc Richards and Dean Bowditch sealed an emphatic victory. “Regardless of the the result, it is about getting across the way we want to play, and it is about everybody coming through unscathed, and hopefully we have. “The lads have played 45 minutes in the game, and they also trained for a couple of hours in the morning. “That goes to show how fit we have got, and how successful the week has been. “I feel a lot fitter. It has been a really tough week, but it has been good. The team bonding has been great. The match was watched by a group of travelling Cobblers supporters, who had also enjoyed a barbecue with the players and staff the evening before, and Buchanan was delighted to see them there. “It was great to have the fans at the game,” said the 31-year-old. The match against Birmingham saw first Cobblers appearances for new signings Ashton Taylor, Regan Poole and Yaser Kasim, and Buchanan says the new faces have fitted well into the squad. “I thought the new lads did very well, and everybody has contrubuted to the performance,” said the former Preston North End man. “It is nice to win any match, and that is what we have to do and take into the first League match at Shrewsbury, but all the lads have done well. The Cobblers players fly home on Saturday, and will then have Sunday off before reporting back to Moulton College for training on Monday. Town travel to Somerset to play non-League side Frome Town on Tuesday night.